Of all the different types of national dance, Scottish country dancing is one enjoyed by a large variety of people and cultures. 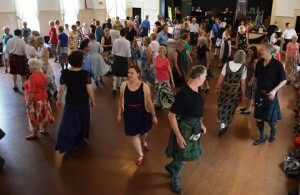 Flourishing Scottish country dance clubs can be found all over the world, and not just in those countries which became the most important destinations for Scottish emigrants. It’s colourful and lively, and the music is irresistible. Enjoy Dancing – Love Music? You don’t have to be Scottish to become involved; it is an exciting form of dance with widespread appeal, enjoyed across the world by people of all ages and abilities. 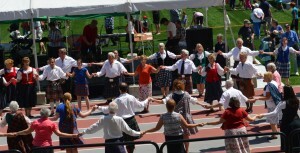 It can be hugely rewarding as well as great fun to experience the thrill of dancing to traditional Scottish music. The dance steps and movements create flowing patterns and dances can be slow and elegant or extremely lively. It is more intricate than ceilidh dancing and includes some lesser known dances. Some dances are over 200 years old, while others are being written today. Don’t worry you don’t need to have experience and you don’t need to bring a partner; all that’s needed is a little enthusiasm. Everyone moves around and you will find yourself dancing with many different partners. So it is a great way to make new friends and boost your social life. Dancing has lots of added benefits. It can improve confidence and self-esteem, and Scottish country dancing is acknowledged for increasing fitness and stamina. One hour’s dancing can burn up to 300 calories, as well as reduce stress, increase energy and improve co-ordination. Research shows that as a cardiovascular work-out, Scottish country dancing can help to lower blood pressure and increase strength and suppleness. And, as a weight bearing exercise it can improve flexibility and strengthen bones. Not only does it shape you up; it helps you stay healthy and increase your overall sense of well-being. Click on Keep-Aging-At-Bay.